This fully furnished two-bedroom condo is equipped to enjoy as a primary residence, a second home, and/or vacation rental property and offers an open concept in the living and dining area. 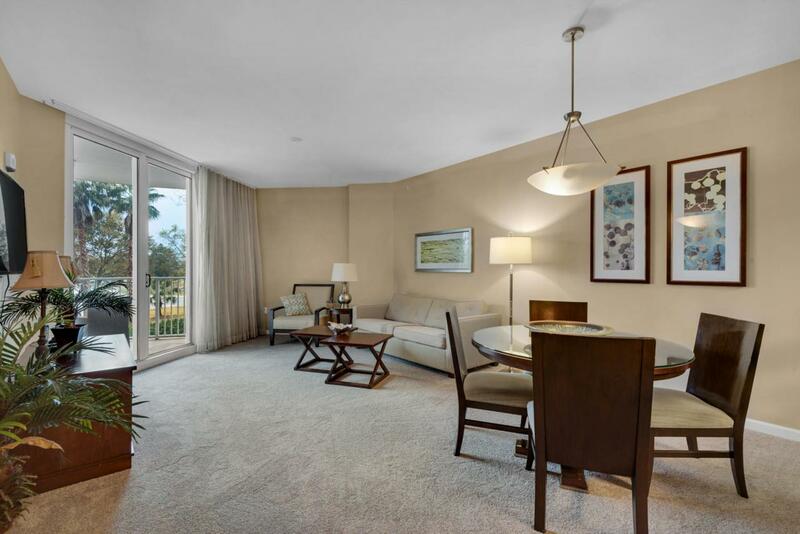 Enjoy brand NEW carpet throughout and tranquil views from your serene and shaded second floor balcony. The rental potential is unsurpassed with projections in excess of $31K+ annually (net to Owner before management). The Palms of Destin is a coded entry building and is centrally located in the HEART of Destin! The amenities are second-to-none including an expansive 11,000 SQ. FT. lagoon pool with waterfall and spa, children's pool and splash pad, playground, elite fitness center, covered parking, lighted tennis and basketball courts, and SEASONAL BEACH SHUTTLE SERVICE to public access.The beautiful lobby is complete with an onsite restaurant and conference center. The HOA fees include ALL utilities, including electricity! In addition to the HOA fees of $2395.72 quarterly, owner's pay a $75 reservation fee for each rental reservation. Buyer to verify any and all information prior to submitting an offer.